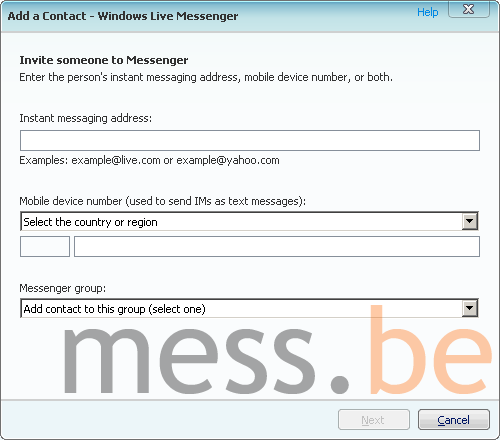 Windows Live Messenger 9.0 Beta: what else is new? So, what else is new in the "private" Windows Live Messenger 9.0 Beta? Here are three items that we didn't cover yet in the posts below. Messer dj-t-up reported that the Add a Contact window had changed. Taking a closer look it appears to have been trimmed down indeed, and the personal invitation message (max. 300 characters) has been moved to a subsequent page. >> Screenshot: Add a Contact window. On the other hand, when you receive an add request, you have the extra options to immediately sort the contact into one of your Messenger groups, or block and report the address as a spammer. >> Screenshot: This person wants to add you as a contact window. Something brought to my attention by Inky is that the Wink, Nudge and Voice Clip buttons are now greyed out in a conversation with someone using a client that doesn't support these features, like a Mac user or a Messenger bot. Saves you a few dummy clicks, I guess. >> Screenshot: Wink/Nudge/Voice Clip buttons (greyed out). For those who thought the previous version of the IM Me control was too limited in colors, sizes and shapes, think again! Today the IM Me control was updated to support different colors and a custom size. Besides the normal conversation window and a simple presence icon, a third option has been added: the IM button. The button shows the presence icon, and when clicked on it will open a conversation in a new window. >> Get your own IM Me control! Adding up the pageviews and download counts currently displayed on the numerous websites spreading the leaked Windows Live Messenger 9.0 Beta (eg. linkage on Lifehacker and Mashable), I think it would be a fair estimation to say that around 100.000 people are covertly using the build. With almost 2.000 per cent more users than originally intended (ie. 5.000), and Microsoft currently just standing around watching, this seems one of the silliest "private" Messenger betas since a long time. In an earlier post we quoted the Messenger product team saying it would shut down the beta if it would get out too widely and cause problems on the dogfood server. Apparently, we're not at that point yet! If official beta-testers were under the impression they'd be getting their hands on the goods way before anyone else, they were wrong. Or will Microsoft, beginning with the next build (whenever it may follow), start to fingerprint downloads from Connect to hunt down leakers, or allow only approved Windows Live IDs to sign in, just like with the 8.0 Beta? Testers are demanding such measures, although fixing already found bugs is rated higher on the priority scale... of course! - You can sign in on multiple points and leave just one or more of them signed on 24/7. - All messages delivered to one location are also delivered to the rest of the locations, including messages you send yourself. - Basically, anything that happens on one location also happens on other locations (including status changes, messages, friendly name/psm updates, etc.). - As for the security point of view, you will probably get a toast saying "you signed in on a different location" and you can sign out specific locations from other locations if you think someone is messing with it. - If no locations are online, a normal offline message will be sent. Currently, the feature is restricted to Beta-testers who have their Live ID's country set to Canada or United States. It also isn't backwards compatible with Windows Live Messenger 8.x or the current version of Xbox 360 Messenger. 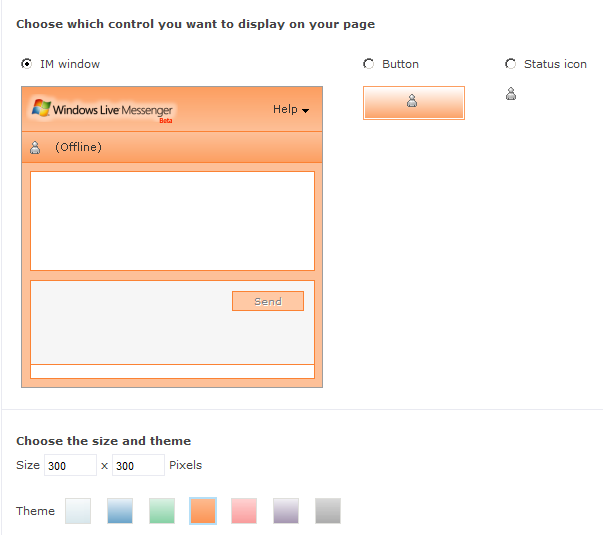 >> More on the new Windows Live Messenger 9.0 features (incl. screenshots) over here. Patchou has let us know that Messenger Plus! Live 4.50 will be compatible with the current Windows Live Messenger 9.0 Beta as soon as it's released early December. He's also proud to finally see the adoption of the sound editor and alerts, which have been part of Plus! since time immemorial. 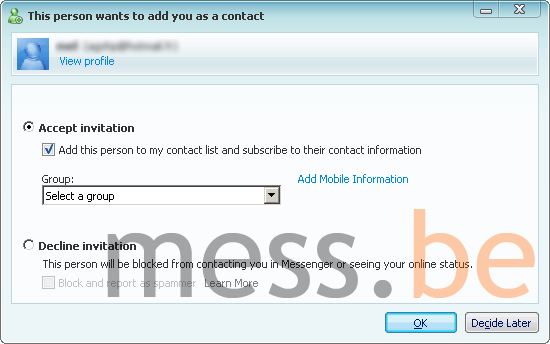 Windows Live Messenger 9.0 Beta: leaked + screenshots! - The graphical user interface of 9.0 doesn't differ from the current 8.5 version, but the About window proves that you're using Windows Live Messenger BETA Version 2009 (build 9.0.1407.1107). - The SPIM reporting comes in the form of a right-click menu item which blocks a contact and reports it as a spammer. We have yet to unravel the mechanics behind the feature to judge its efficiency, but I assume that it could work out nonadvantageous for a contact who accidentally runs into a Messenger worm. - In the options menu, you can configurate the sign in at more than one place feature. Those who had their worries rest assured, you can still sign yourself out when logging in somewhere else, or -and this is new- stay signed in everywhere. You can also (re)name your current "place" (read: system) as it would appear in Messenger. - The menu to change the default Messenger Sounds has become easier to use and an ever important "Mute all sounds" option has been added for those who like to work in a silent environment. From the same menu, you can change your signature sound which plays back every time you sign in, to either one of the default ones or a custom one (maximum 5 seconds) extracted from one of your mp3s or other audio files using a handy, built-in sound editor. - Other new features like Animated Display Pictures or hyperlinks in Personal Status Messages are not illustrated in these particular screenshots. UPDATE: After reading this, n-blue added an extra screenshot showing how one or more links in your personal status message automatically become clickable. And although static, the screenshot also shows an animated gif being used as display picture. Note how animated images with dimensions smaller than 96x96 pixels aren't enlarged, but instead are centered in the display picture area surrounded by a white border. >> Download Windows Live Messenger 9.0 Beta. UPDATE: I have removed the direct download links on request of a few long-term Messers who fear another shutdown of the beta. Let me remind you that we DID NOT leak the build ourselves but simply found it out there, very easy to get. We were sent the build by many our most generous visitors a few minutes after it had been released last night (and thanks for that guys), but it is only after we've seen it posted at a few locations that we shared the already public links. If you decide to download it from somewhere else after all (check the source of this post for starters UPDATE: download links have been removed by now), you'll be doing it at your own risk (be aware that installers can be tampered with) and at the risk of suspending the 9.0 Beta, thus spoiling all the fun. As predicted in our post earlier today, the Windows Live Messenger 9.0 Beta has been reinstated after a short delay. Tony pointed me to a forum post which states that the beta program is currently limited to 5,000 testers but that it will later be expanded to a larger group. So for now, just a few thousands of lucky invitees can download their 17.26 MB copy of build 9.0.1407.1107 from Microsoft Connect. We'll let you know asap if we know a way to become an official tester. A leak would be pointless because the product team said that "if the build gets out too widely and starts causing problems on the service we may have to shut it down." * Signature sounds – Pick your own personal sound that your contacts will hear when you sign into Messenger (only works if you and your contacts have Messenger 9.0 Beta). * Animated Display Pictures – Show your moves! Messenger now supports animated .gif files as display pictures. * Link in Personal Status Message – URLs in Personal Status Messages are hot and clickable in the Messenger contact list. UPDATE: jrgbx just informed me that Messenger Plus! Live is not compatible with v9.0. The upcoming Messenger Plus! Live 4.50 is unlikely to be either, but we'll check with Patchou about that. UPDATE #2: Patchou let us know that he has artificially blocked compatibility with WLM9 for now: "If I find time to work on it this week, the final version may be half compatible with it. In any case, it's no big deal considering the state of Messenger 9 (alpha, buggy, crashy)." Hello again, everybody! I have returned safe and sound from a short stay in the fantastic city of Barcelona, hence the lack of posts since last Wednesday. Browsing through the "latest" in the world of Messenger, it's silly to see how slow the big news sites are picking up on the Windows Live Messenger 9.0 feature list which we posted last week (before anyone else -may I add- except for the person who leaked it). Not surprisingly, the Messenger product team wasn't too happy seeing the not-yet-to-be-disclosed list reprinted on Mess.be and decided to disable access to the private 9.0 beta altogether until further notice. We're sorry to have influenced this decision and for the inconvenience it has caused, but the information was up for grabs and being the WLM zealots that we are, we had to share with the community. Fortunately for those affected, the embargo won't last much longer and they will regain access soon.